LFC Foundation joined forces with Everton FC in the Community and Tranmere Rovers in the Community on Thursday to stage a series of free football coaching sessions, as part of the Giant Spectacular event. Hundreds of local pupils from 72 schools across the region were invited to the unique event in Princes Park, which marked the return of Royal de Luxe’s Giants to Liverpool. 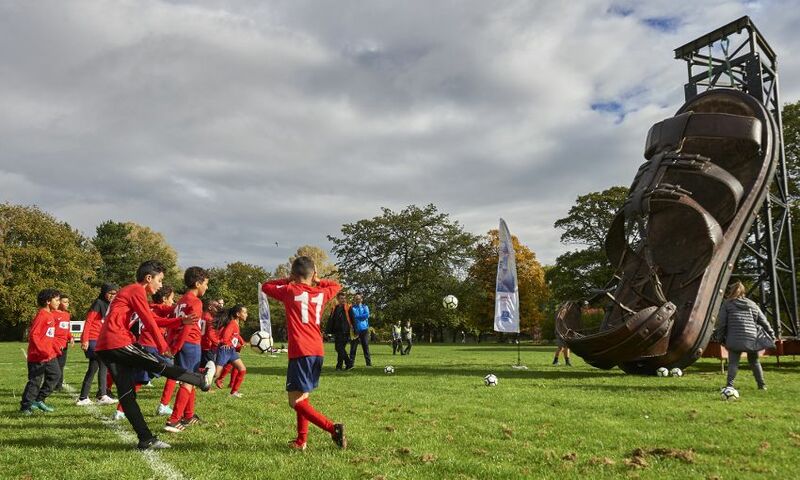 Each school was allocated a one-hour coaching session, which included multi-sport and mini-games, and ended in a penalty shootout with a difference – straight into one of the Giants’ shoes. The giant sandal, which appeared at Canning Dock on Wednesday and made its way to the park overnight, was the first sign of the Giants’ arrival ahead of their farewell performance across the city this weekend. Jamie Sproule, a teacher at St Patrick’s Primary School, said: “This has been a brilliant opportunity for our kids. LFC Foundation provides a range of free football and multi-sports sessions in public parks and community centres throughout the Liverpool City Region – click here for more information. The Giant Spectacular – created by the world’s leading street theatre company, Royal de Luxe – is one of the major highlights of the Liverpool 2018 programme. This weekend will see the Giants’ third and final visit to the city.